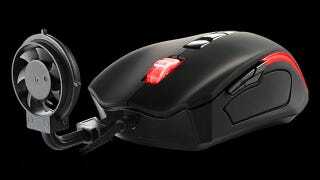 Previous efforts of gaming climate control have managed to integrate the cooling elements into the mouse itself, providing sweat relief through a series of vents on its outer shell. But the Black Element Cyclone just features a mini USB port on the front where you can attach an included miniature fan that's directed at your hand. So in practice, it seems like it's only going to cool the top of your hand, not the palm where the sweating is usually at its worst. But even if it's not effective at dealing with sweat, the Cyclone mouse certainly looks like the perfect accessory for blasting away Cheetos cheese dust.